One of my favorite baseball games of the decade was played in Cincinnati, Ohio, on June 6th, 2017, between the Cincinnati Reds and the St. Louis Cardinals. That’s the day that Ryan Joseph Gennett hit the 39th, 40th, 41st, and 42nd home runs of his then-five-year-old career, and in so doing became just the 17th player in baseball history to hit four home runs in a single game. Nothing else of any real import happened that night; my delight in its existence is driven entirely by the improbability of Gennett’s accomplishment. As our own Jay Jaffe noted for Sports Illustrated that week, Gennett was at the time — with the possible exception of Mark Whiten — the most unlikely four-homer player in the long history of the game, and his remarkable power surge appeared then to be one of those strange, miraculous occurrences that baseball occasionally throws at us as further evidence of its unpredictability, like Bartolo Colón throwing 38 consecutive strikes against the Angels, or going deep that one time against the Padres. Nothing, I thought, could be stranger than Scooter Gennett hitting four home runs in one game. I was wrong. It turns out that hitting for power is kind of Scooter Gennett’s thing these days. In fact, since June 7th, 2017 — the day after his four-homer game — just 27 of the 67 players with as many plate appearances as Gennett’s 635 have a higher isolated slugging percentage than his .220. Since June 7th, 2017, Gennett has a higher ISO than Kris Bryant. Throw in his four-homer day — it did, after all, really happen — and only 16 players top his .239 mark. Gennett’s four-homer game was surprising a year ago. It would be far less surprising now. Scooter Gennett currently has the 10th-highest slugging percentage in baseball (to be fair, his ISO, which strips out the effect of his extremely high BABIP, is significantly lower). One way or another, he should probably be an All-Star. But why? What’s changed? 2018 stats through games played 6/11/18. 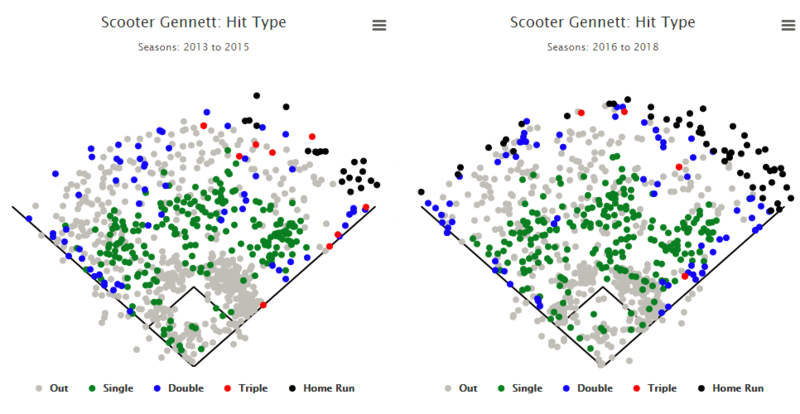 On the left are Gennett’s hits from 2013 to 2015, when he hit 21 home runs in 1,095 total plate appearances, and none to the opposite field. On the right are Gennett’s hits in the 1,299 plate appearances he’s taken from 2016 to present, 53 of which have resulted in home runs — including some the other way! Now, you may view this differently than I do. You may think that a four-point increase in fly-ball rate, coupled with a slightly higher hard-hit rate, is enough to explain the tremendous power surge we’ve seen from Scooter Gennett in the last 24 months. But when I see Gennett making only modest changes — and not especially consistent ones, either (the fly-ball rate has jumped all over the place) — and I see the line of grey dots dotting the warning track from 2013 to 2015 become so conspicuously black from 2016 onwards, I begin to wonder if Scooter Gennett was uniquely positioned to benefit from a ball with less air resistance. Indeed, Jeff Sullivan made a similar point about the “middle class” of power hitter in September of 2016. It’s a theory that, although speculative, is consistent with the data. Among the 236 players on whom Statcast has collected such data, fully 219 have recorded a greater average distance on their home runs this year than Gennett’s 377 feet. It’s not like he’s crushing these balls. It’s that he’s getting them in the air like he always has — maybe a little bit more, maybe a little bit harder — and seeing a correspondent increase in power far out of proportion with the magnitude of the change he’s made, thanks perhaps to a ball that flies just a little bit farther. As far as we can tell, changes in the ball’s composition probably mean a difference of just a few feet of traveled distance. But for Gennett, those few feet have been enough — in combination with a slight change in approach — to turn a bunch of warning-track flies into home runs, especially to the opposite field. As far as I can tell, he’s right there, balanced on the edge of the home-run revolution. He is the marginal player, turned extraordinary. And perhaps we shouldn’t be too surprised if he turns in another four-homer game some day soon. We hoped you liked reading The Evolution of Scooter Gennett, Power Hitter by Rian Watt! Rian Watt is a contributor to FanGraphs. His work has appeared at Vice, Baseball Prospectus, The Athletic, FiveThirtyEight, and some other places too. By day, he’s a public policy researcher in housing & homelessness. By night he tweets. I think you hit the nail on the head. The two spray charts don’t really look all that different to me. He had warning-track power before, especially to opposite field. I think he’s selling a little contact for a little more power, and happened to time that change perfectly with the change in the balls’ aerodynamics.